In July 2005 an Invitation was received for PORTWEY to attend the 2nd annual London Boat Show. 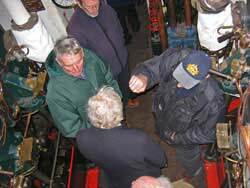 This was recognised as being a golden opportunity to have the Tug open and in steam for visiting by the general public in their hundreds if not thousands. The 1931 built steam (but oil fired) tug CHALLENGE, and the 1945 built ‘puffer’ VIC56 also attended and we were all well supported. Much of the autumn was therefore spent in repairing, cleaning and painting PORTWEY both inside and out. The forward cabin was to be the ‘museum’ and sales area, and a system for showing visitors around the vessel without confusion was devised. Crew and Guides had to be arranged to cover the ten days and with a minimum of eight or so volunteers needed each day (four for the Engine and Boiler Room and four on deck, in the cabin and wheelhouse) this caused the need for considerable planning. Crew had to remain on board each night for safety and security reasons. The organisers required paper work, the main item was a Risk Assessment Scheme, which had to be planned and implemented. Passes had to be arranged and photographs for these provided. food had to be obtained for each of the ten days, and at three meals a day this was no mean task. We are indebted to our Historian, Peter Clisby, who cheerfully took on this chore on most of the days. Other members, and the wives of two, also provided meals for which we were most grateful. 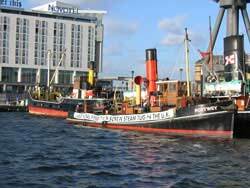 Having had the boiler surveyed following last minute replacement of two fire tubes and one of the feed water valves securing bolts, and loaded 10 tonnes coal at the end of December, on 5th January PORTWEY was ready to steam the vast distance of one and a half miles from the West India to the Royal Docks. At least not much coal was needed for this journey! 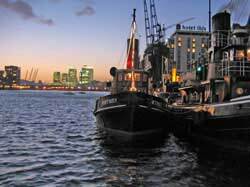 These docks consist of three separate stretches of water, the Royal Albert, the King George and the Victoria. They still form the largest enclosed stretches of water in the country - together providing some three miles of clear water. The vast Excel exhibition centre has been built on the site of the refrigerated warehouses which used to unload frozen and chilled meats and fruit from ships of the Blue Star and New Zealand Shipping companies amongst many others. The London City Airport lies between the Albert and King George Docks, otherwise the vast acres once covered with warehouses and all the paraphernalia of shipping lie empty. Other than during the Boat Show virtually nothing moves on the water. 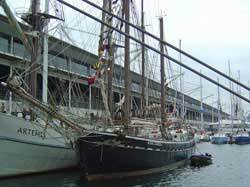 The Trust Secretary and a number of Trust members spent much of their working lives either on ships using the Royal Docks or working ashore within the Dock complex and thus found the visit to Excel brought back many memories. It is very hard to believe that the Docks closed to commercial traffic nearly 25 years ago! Movement of shipping within the Royal Docks is closely controlled by the Airport Authorities as the aircraft landing guidance systems can be upset by chunks of metal floating past! Therefore movement can only take place between aircraft landing and taking off times. PORTWEY joined a group of vessels waiting to enter, amongst which was ‘SUHAILI’, Sir Robin Knox-Johnston’s round-the-world yacht, still looking in mint condition. A large R.N.L.I. Lifeboat was also there which was comforting. The first weekend saw storm force gales which, of course, affected the north of the country and Scotland badly, and then came a day of rain. Fortunately, after this, although still windy the weather eased and at the end of the week there were some fine days. PORTWEY was opened to visitors from 1030 until dusk, at about 1630. Each day there was a constant stream of visitors, and on occasions entry had to be restricted to prevent too much congestion. The coal-fired boiler was the centre of attraction and allowed visitors to warm up following a cold wait on deck. The forward cabin housed the ‘museum’, showing pictures of the Tug from the Trials Voyage on the Clyde in 1927 through to the present time. Other artefacts and sales items were also in the cabin. Visitors then went to the Wheelhouse and could shock people all around by blowing the whistle. PORTWEY and CHALLENGE steamed up and down the Victoria Dock at lunchtime on most days. This gave much exposure to the crowds examining the fibre- glass yachts ranged along the quayside, and to those visiting the frigate HMS Sutherland. Although the show was due to finish on Sunday evening, the King George V lock would not be opened until 9 p.m. This was far too late for PORTWEY, as the crew would not have had everything ‘put to bed’ until well after midnight. So the return to the West India Dock had to be made on Saturday and we parted company with CHALLENGE and VIC56 at 2 p.m. All agreed it had been a worthwhile exercise, although hard work during each of the 10 days. It was estimated that approximately 1000 visitors were shown round. Approximately £2000 was taken from the general public by means of sales and donations which did pay for the coal! Although not of the best quality this did keep the tug in steam and did not make clouds of smoke as dire predictions had thought it might! As a final thought, PORTWEY’s boiler was kept in steam for 12 days, the longest period since the Tug came to London from Weymouth in 1982.